This giant map of the world really is huge! It is the largest single sheet world map wall poster available to buy. The political wall map features every country as a different color, with all of the major towns labelled on the giant world map poster and capital cities clearly marked. Designed by specialist map makers, hill and sea shading add to the vibrant overall effect of this beautifully big world map poster. A truly huge world map - giant size and the highest quality cartographic detail makes this ideal as a classroom world map. 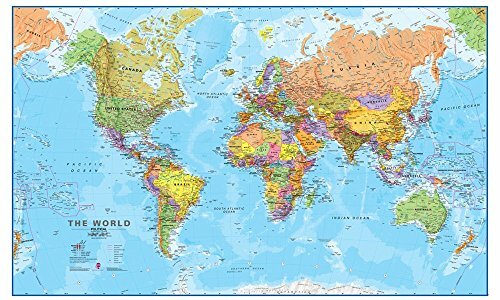 Measuring 78 (w) x 48 (h) inches with a 1:20m scale, the world map poster features front sheet lamination which gives the giant map a write-on, wipe-off finish. That means that any writing made with a dry wipe marker or Chinagraph pencil on the wall world map can be wiped off with a damp cloth. Your extra large wall map poster is supplied in secure, protective packaging, rolled in a tube for crease free delivery and immediate display. EXTRA LARGE WALL MAP: This giant map of the world measures an enormous 78 x 48 inches, with a 1:20m scale, making it an eye catching addition to any room. STUNNING DETAIL: The political map of the world features colored countries, clear towns and cities, and the world map is finished with hill and sea shading. WRITE-ON WORLD MAP: Laminated on the front sheet, this is perfect as a classroom world map as it can be written on with whiteboard pen and wiped clean. CREASE-FREE DELIVERY: Your huge world map poster is rolled in a tube for delivery, so it arrives ready to display.